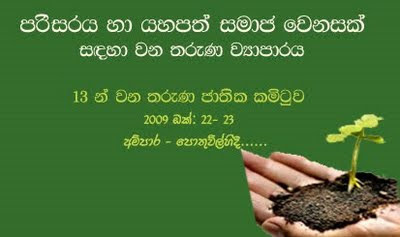 According to the National coordinator of Y-MESOC, the 13th National committee meeting will be taken place in Pothuvil, Ampara district located in Eastern province. At least 05 youths in each district partner organization participate in the meeting. Especially they have planned to discuss in the meeting the issues of Economic crisis, Climate change, and how they can involve finding solution for healing this environment which is being destroyed day by day… This is scheduled to be conducted for two days from 22nd October 2009 and the future activities of Y-MESOC will be drafted at the end of the meeting..